Mika: Me out! Me out! Kit: What is it, Mika dear? Mika: Me out! Go scout! Garden is Mika's and the hour of the prowl is noww! Kit: You want to go out in the garden? Mika: Yesss. Should listen more. Mika out! 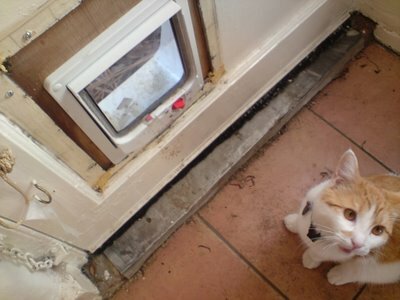 Kit: But the catflap isn't locked, baby. Mika: Mika big! Tape open door! Kit: No, sweetie, Mika's big so we don't tape open door. Mika: Makes no sense. Portcullis up! Noww! Kit: No, honey, we can't have it open all the time. And we showed you how to push it open, you remember? We pushed and it opened? Mika: Pushed with hands. Hands is for waiting on Mika. Paws is for catchin mice with sticky clawws. Mika the mighty! Kit: But then Daddy showed you with his head, you remember? Mika: Yess! Was revelation! Mika the brilliant! Daddy pushed flap with his head, so Mika perceived, in moment of genius! Mika could push flap with her head, and it opened. Mika takes a bowww. Kit: But what I don't understand is this, sweetie. You've worked out that you can open the door by pushing on it when you want to get in. But when you want to get out, you can't seem to understand the principle. You come and mew at me instead. Mika: Mew? True. Have to tell you what to doo. Kit: But if you just pushed it with your head, like for outside, it would open. Kit: I know. We keep posting you through the flap. We were hoping you'd get the idea that way. Mika: You posts Mika. Scowwwl. Mika frowwns upon you. Me out! Kit: You have a very specific and concrete kind of intelligence, don't you sweetie? Mika: Yess! Mika's brain massive and weighty! Withowt a dowwt! Now let Mika owwwt! Kit: Okay, hon. But that does mean it's posting-time, I'm afraid. You should make this a newspaper column. Daily! Seriously, I laugh as close as an introverted person can get to out loud when I read this. Mika: See? They says Mika star! You should pay Mika royalties. Kit: Honey, you are royalty. Mika: True. Mika the magnificent! Will settle for fish treat. Cat intelligence is very clear. 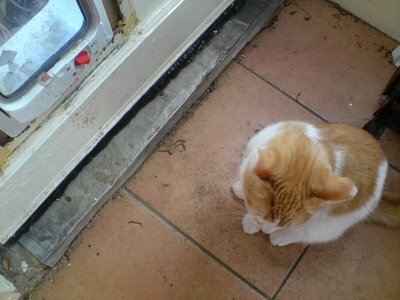 If there is something which the cat *could* do, but you could also do, why should the cat waste her energy doing it? See also: swirling the water around in the dish, looking at the plants on the table, eating the food that is already there at 4 am. Indeed, I think you're right. After I wrote this dialogue, when I was trying to photograph her fussing at the catflap, she eventually got bored with me standing around pointing a camera at her and pushed the door open herself! Thank you for the insight into your kitty's thought processes! My kid wants to tell you she's a Mika fan. Also, she wants you to be nicer to Mika. Give her more fish treats! My kid wants to tell you she's a Mika fan. Also, she wants you to be nicer to Mika. Give her more fish treats!Hi to your daughter! And in case she's worried - I am pretty nice to Mika, on the whole. Fish treats are limited to keep her weight healthy, but for the most part we have a very amicable relationship. It's just that our conflicts are funnier.